EDMONTON — It’s hardly surprising that the very unpredictability of a 9-1-1 call can raise stress levels for anyone. For Emergency Medical Service (EMS) practitioners on the frontlines, attending to distressing situations day in, day out, can take a toll on their mental well-being. To combat their high level of stress, a space called the Zen Den — a quiet place for practitioners to step out of their roles and breathe, so to speak — has been created at the Queen Mary Park EMS Station. “Having this space will help practitioners recognize when they need help, hopefully before it’s too late,” says Candice Zunti, a former paramedic who struggled with her own mental health on the job. Her generous donation of $5,000 — with AHS helping to match this donation — and her involvement in helping plan the space, proved integral to getting the project off the ground. In addition to relaxation, the space features activities — researched beforehand to see how well they promote positive mental health — such as yoga, meditation and art therapy. It’s the perfect place for EMS staff to wind down after a stressful call. A key element of the space is that it’s free of anything that might remind practitioners of their line of work. The walls are bare. The lighting is soft. Yoga mats are perfectly centred on the floor. Plush meditation pillows sit off in a corner. Before entering the space, EMS workers take off their work boots, a signal to their brain that lets them know it’s time to relax. These visual cues enable workers to completely separate the Zen Den from the station. 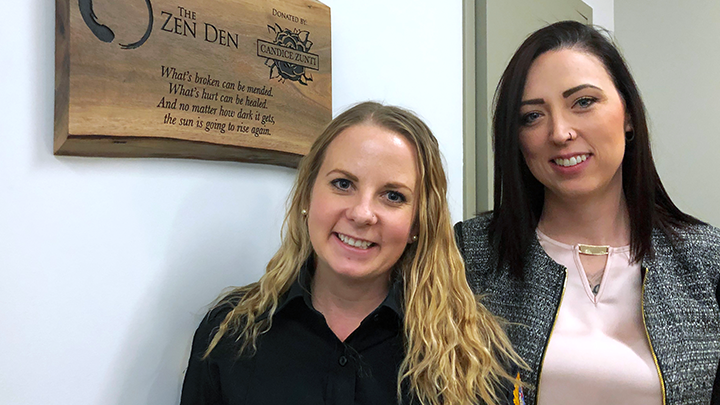 For Zunti and Varga, the Zen Den represents the hope and progress that’s being made to address the mental health of EMS practitioners.